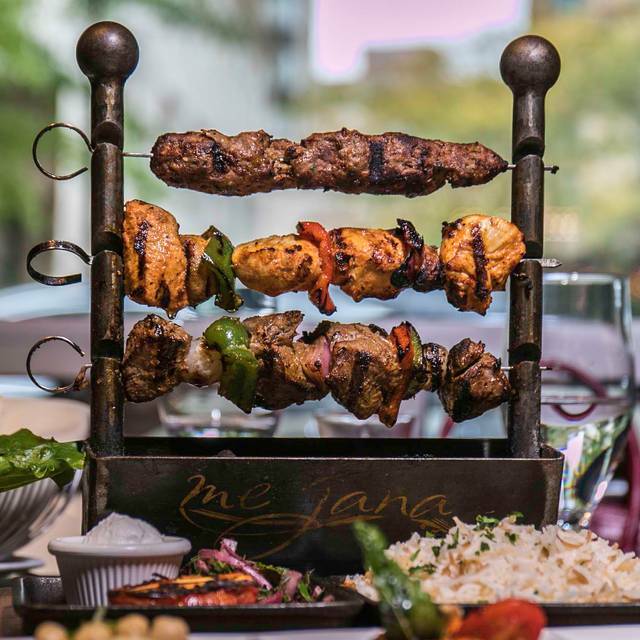 You must make reservations at least 5 minutes in advance of the time at MeJana. Clarendon Blvd and N. Adams St.
Across the street from the Courthouse Metro stop. 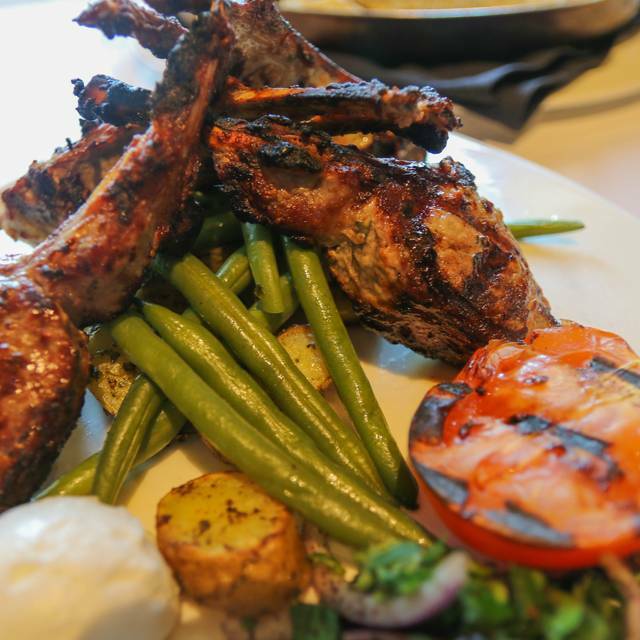 Fine Lebanese Cuisine in a warm upscale contemporary space. grenn pepper, tomato, cucumber, red onion, olives, mint & lemon vinaigrette. 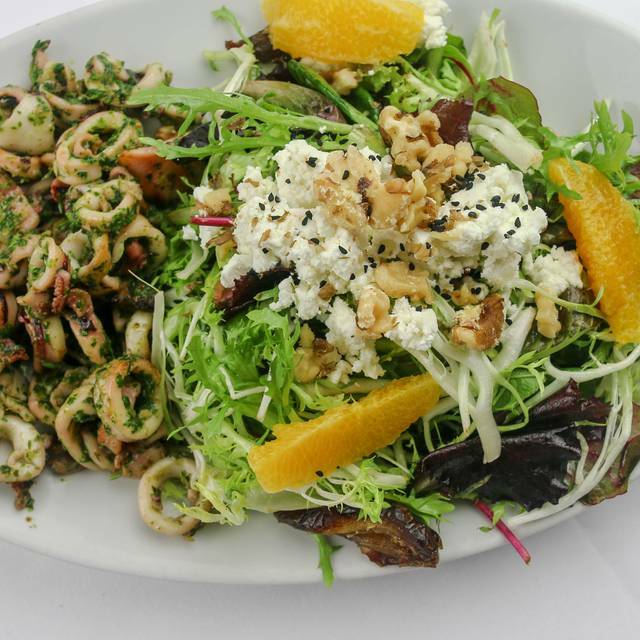 mixed greens, orange, dates & walnuts, tossed with citrus vinaigrette & nigella seeds. goat cheese, walnuts, pears, lemon & vinaigrette. fresh vegetables with olive oil, lemon juice, sumac and pita chips. mixed greens, sliced pears & roasted walnuts, dressed with acitrus vinaigrette. tomato, figs(in season), basil & balsamic vinegar. parsley, mint, onion, tomato, burghul, olive oil & lemon. slow roasted chicken served in pita bread with pickles & garlic whip. fried chickpeas and fava beans croquetts, tahini sauce, pita bread, lettuce & tomato. tomato, lettuce, red onion, mayonnaise served in ciabatta bread. focaccia bread, pesto, lettuce & tomato. grilled ground beef & lamb skewer, hommus, grilled tomato & suma onions in pita bread. spicy homemade beef & lamb sausages sauteed with tomato sauce in pita bread with garlic whip & cucumber pickles. grilled eggplant, portabella mushrooms, roasted pepper, zucchini & goat cheese on ciabatta bread. lunch menu items are served between 11:30 am and 2:30 pm. white anchovy filet, roasted red pepper, pine nuts, zest of lemon & olive oil. smoked eggplant with tahini, lemon & garlic. fresh large calamari grilled & tossed with cilantro. manchego & feta cheese in phylo dough, fried crispy. chickpeas & fava beans croquettes with tahini sauce,tomato,parsley & mint. lima beans stewed with tomato, garlic & cilantro. beef & burghul dumplings stuffed with onion, pine nuts, ground beef & lamb with labneh. stuffed with rice, tomato, onion, parsley & mint in olive oil & lemon juice. 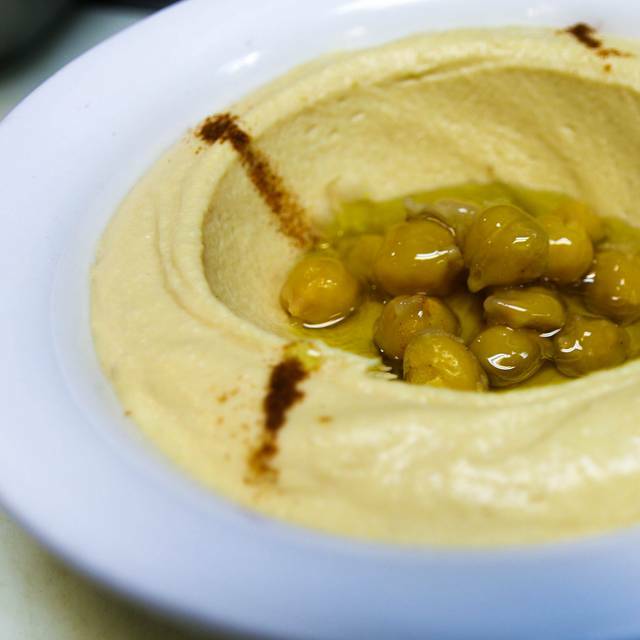 a dip of pureed cooked chickpeas, tahini & fresh lemon juice accented with olive oil. with sauteed beef & roasted pine nuts. raw beef mixed with burghul, onion & mint. strained yogurt topped with zaatar & olive oil. 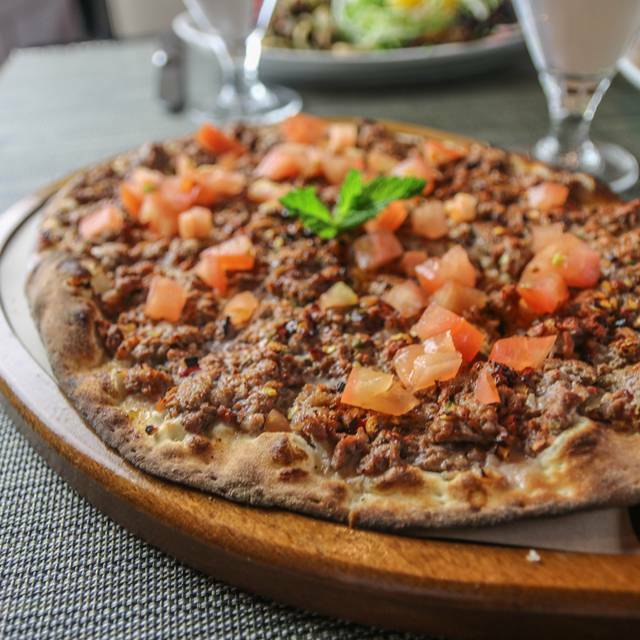 pita bread topped with ground lamb & spices. cooked lentils,potatoes,swiss chard & cilantro. a stew of green beans,tomato & garlic. lebanese sausages sauteed in olive oil & lemon juice. fried dumplings of potato, burghul, almond flour stuffed with spiced feta cheese & pine nuts. bronzed halloumi cheese w/pears & dates. spinach, onions, sumac, olive oil & pine nuts. spicy homemade beef & lamb sausages sauteed with tomato sauce. fried and tossed with fresh thyme. shredded zucchini mixed with mint, scallions,egg whites & manchego cheese. baked with rosemary, lemon juice, shaved garlic & white wine. ground lamb & beef mixed with spices, sumac, onion, & garlic whip. marinated in garlic,rosemary & mint served with arak roasted potatoes. 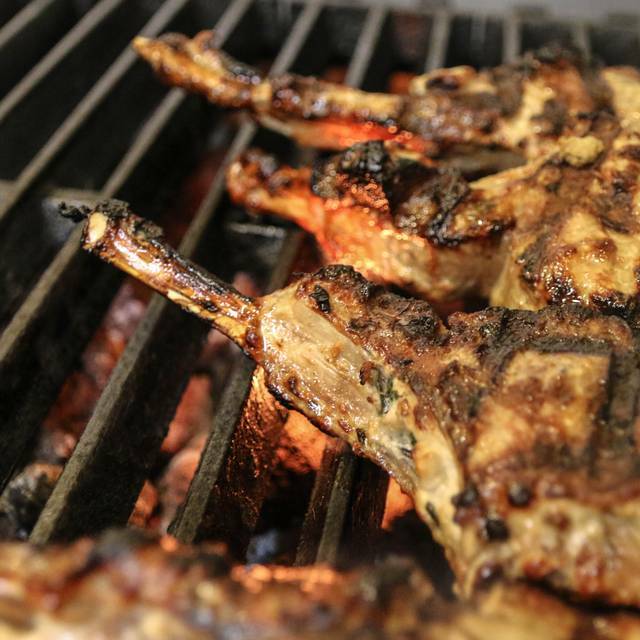 cubed lamb marinated in olive oil & spices. white truffle, potatoes & pearl onions. a combination of chicken, lamb & kafta. seared chilean sea bass over manchego polenta, shitake mushrooms & a light tomato broth. baby greens, oranges, fennel, cucumber & scallions with citrus vinaigrette. grilled marinated chicken kebob, lebanese rice sumac,onion & garlic. Me Jana never fails to impress us. The flavors of the food, while authentically Lebanese, are more heightened somehow. We eat a lot of Lebanese food and this is by far the best one in the area. Staff is attentive and friendly, portions are generous. It’s a bit pricey so not an everyday place, but always special. And as an added bonus, they will validate your parking ticket from the garage next door on Adams St, so always have free parking. What a pleasant place to have lunch. Low noise level so you could hear each other talk. Very good food. Reasonable portions. Friendly people. Great place for a relaxed lunch with friends. Food was delicious! I can’t eat meat or seafood so my choices were limited but the chicken shawarma was great! I always love coming here. Excellent food, excellent service, and I love the atmosphere!! 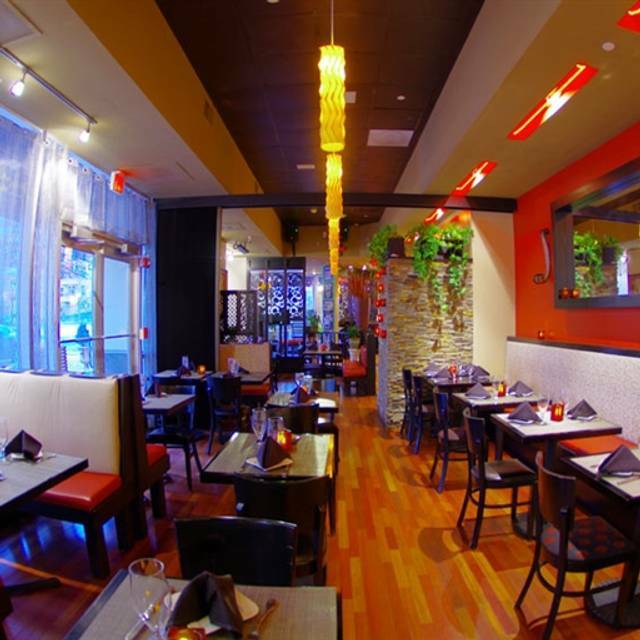 Wide assortment of dishes and attentive staff made this a great place for business dinner. Great food and service even on a very busy Saturday night! Food was excellent. Split a number of appetizers amongst the group for starters and entrees. Some in the group still had room for full size plates, the rest ordered more appetizers. Leave room for dessert and coffee. The food and staff were amazing. Everything was prepared very well and we enjoyed a great night. Me Jana was recommended by a Lebanese friend, and it didn't disappoint. The food and the service were both excellent. Our waiter patiently explained the dishes we weren't familiar with and was most attentive throughout the meal. Our orders arrived promptly at a perfect pace between courses. It's definitely a restaurant worth returning to. Fantastic food and service. I could have ordered everything on that menu! The food was authentic Lebanese and quite good. The service was excellent. Meals are fairly priced. However, the restaurant is very loud, not the place to go if you want to want to carry on a private conversation. My parents and I had a wonderful experience! We loved the food, particularly the chicken and lamb skewers! As always, MeJana has a terrific menu, great food, and very attentive service. In addition, prices are very reasonable. Great authentic Lebanese food. Highly Recommend. Arlington gem. One of the better Lebanese restaurants in the DC area. Always drop in when visiting the area. Reliable neghborhood restaurant. Food, presentation are consistently good. Good mid-eastern wines too. Service is considtently friendly. Rstaurant itself has an intimate vibe. It is a great place, though 15-20% more than my typical dining out choices. We had a friendly business dinner at Me Jana on Saturday evening. They seated the 8 of us at a round table - perfect for ensuring we were all able to participate in the conversation! They worked with us on the food concerns (dietary restrictions and allergies) without pause, and we enjoyed all of the dishes. There was so much, we couldn't finish it all. Our server, Cassey, was very accommodating without hovering. While it was loud in the restaurant, we were there for prime dinner time, and we certainly contributed to the noise level. If you like Lebanese fare, this is a great local place! The food was fine but nothing exceptional. The service was about the same. We’ve been here several times over the last few years and the overall experience has declined each time. Very good middle eastrn foodand I would definately go back and recommend it. Wonderful food and service. We are regulars here and have never had a bad experience which is rare. Great place, great food, great vibe! Had a nice dinner with family and friends. Nice atmosphere, delicious food -definitely we will come back! Good food . Love the pita and baba ghanoush. We had the lunch special which included hummus, baba ghanoush, several appetizers. 3 different meats and then dessert. Me Jana has consistent and delicious Lebanese cuisine. I eat here every month or so and always find it excellent. 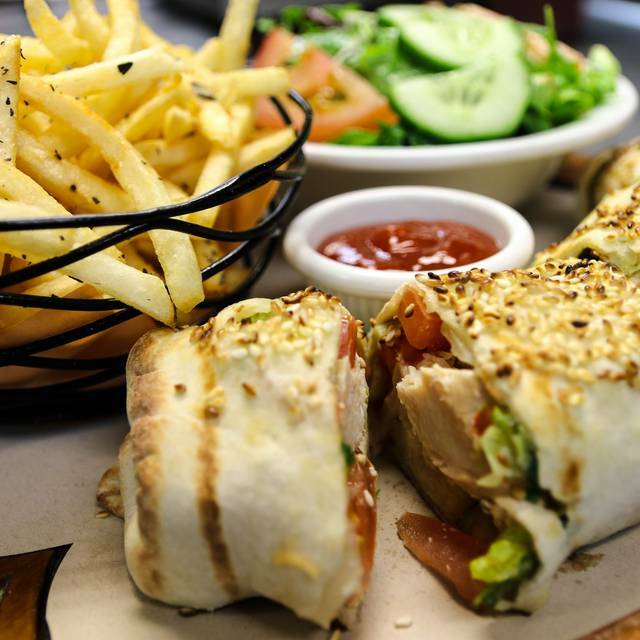 Try fattoush salad and chicken kebab after starting with baba ghanoush! Was an excellent authentic Lebanese experience that reminded me of my grandparents cooking. The best compliment I can give. We had dinner on Valentines Day. This was our third visit to Me Jana in the last 12 months. This visit topped all previous visits by far. We were seated immediately as we arrived which was a few minutes before our reservation time. We ordered seafood dishes from the regular dinner menu. Food was delicious. The Lebanese Cabernet was perfect with our meal. Service was attentive even though the place was completely full. Special thanks to Riya our main server. She greeted us with a smile and a rose for my wife. She was always cheerful and eager to serve. She never seemed to busy or inconvenienced to answer our questions about the menu. She made great recommendations. We never felt rushed. The place was noisy but did not distract my wife and me from nice conversation. Will be back without question. Went on valentine day for dinner. Tables are extremely small, leaving very small room for intimate conversation or laying of platters of the food. The food was mediocre but acceptable. It seems an attempt to bring Lebanese modern approach but missed the authenticity of the real flavors of Lebanese food. Service was good in terms of honoring our reservation and I'd say if this is not a 'once in a lifetime visit' than you will not be disappointed. again, tables are way to small to accommodate the dishes so you feel very cramped, in my opinion. First timers on Valentine’s Day we had a great dinner and wonderful time. Service was warm and graceful, decor is clean and colorful and our fellow diners were charming and fun. Maybe the stars were aligned but it all came together on this night. By far my favorite restaurant in the Washington area. 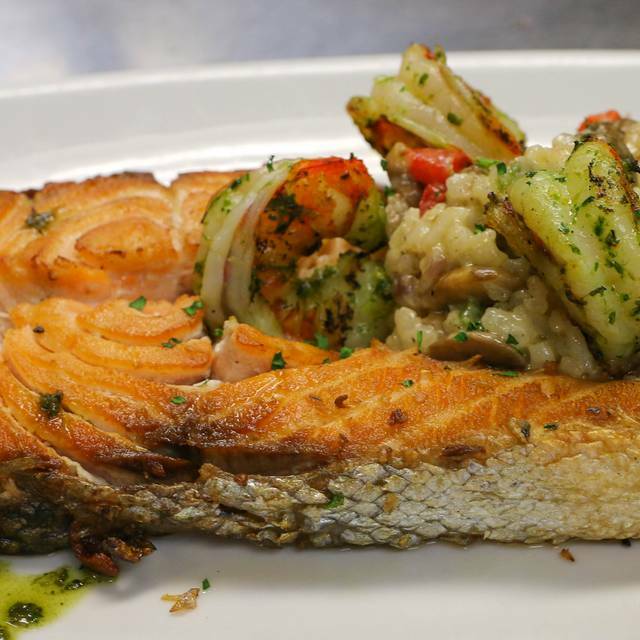 Delicious food, great menu and service. The food was delicious and the service, attentive and helpful! They were really nice in helping our family celebrate a number of birthdays. The ambiance, staff and food was outstanding!!! I highly recommended this place! This is a nice place. The service was outstanding, beginning with a very warm welcome, and despite staff trying to sell us a $75 bottle of wine. Our server was fantastic in every regard. The food was good.. and im eating my leftovers now. Having said that, there is better Lebanese food in town and I'll more often go elsewhere. However, if I'm in the neighborhhood, I would not say no. It's a good place. Decor is nice also but booths are a bit uncomfortable in that they sit up too straight.